Plans for the 2014 Winter Olympics in Sochi have been rife with controversy from the start. With logistical construction issues, rampant environmental destruction, violations of workers’ rights, corruption allegations and serious concerns about security, few aspects of the games have been able to escape condemnation. The nationally televised election for mascot of the Winter Olympics in Sochi became a telling model for Russian elections in general and a possible repetition in the upcoming Duma and presidential elections. The elections aired on Channel One for Russians to choose the mascot for the 2014 Winter Olympics in Sochi bore an entirely predictable result, albeit one that directly contradicted the population’s opinion. The winner was the snow leopard, with 28% of the vote. This only happened because Vladimir Putin, while in Sochi, spoke out in favor of the snow leopard right on the day of voting. 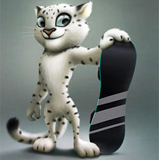 It’s true that the Olympics had to be split between three mascots, since not one received more than half of the vote – the polar bear (18%) and bunny (16%) were added to the leopard. Meanwhile, according to a VTsIOM survey conducted on February 5-6, 2011, Russians had no plans whatsoever to vote for the leopard. By all criteria [listed by VTsIOM as factors that could influence voters’ decisions – ed. ], Russian citizens chose Father Christmas as the most popular mascot. Moreover, the dolphin and brown bear were on the shortlist of favorites. With 20% of the vote, the leopard actually took second place (in first was the snowflake) for anti-mascot – ones that Russians definitely did not want to see as symbols of the Sochi Games. Incidentally, Sochi residents themselves chose the dolphin as mascot for the games in 2008, although the Olympic organizational committee immediately warned that the opinion of these hosts of the Olympic Games was not going to be decisive. Channel One has shown how the prime minister turned public opinion in his favor in a single word – before his retort, Russians categorically did not want to see the leopard as mascot of the Sochi Games, and afterwards made him the leader. Or how to manipulate the nation’s will – the Russian authorities have plenty of experience falsifying election results. At the same time, President Dmitri Medvedev did not express his own preference for mascot. But then, in a move no less telling of role casting in the tandem, he brought attention to the disparity between the election results for Olympic mascot that were held on television and online. At a session of the Commission for Modernization and Technological Development of the Economy, the president called for deliberation to be carried out – including over the internet – over the design of a universal electronic card for Russian citizens. “I hope that it turns out fairer than the consideration for our Olympic symbols was,” Medvedev said. “In any case, there won’t be the kind of discord as there was between votes on television and votes over the internet,” Medvedev added. The problem is not that the Olympics are going to have three mascots at the same time, none of which are the ones that the hosts of the Games in Sochi or the majority of Russian citizens wanted to see. The problem is that neither the wave of revolutions against kleptocratic regimes in the Arab world nor the abundant history of revolutions and plots by the elites in Russia itself is going to teach the Russian government. As before, it is prepared to falsify public opinion on any matter to satisfy the personal ambitions of its leader. In this sense, it is critical for Russia that the elections for Olympic mascot not resemble the coming elections for the Duma – or, especially, for president.